It was a moment to savour. With the sun high in the Arizona sky, a ray of light beams down through the narrow opening of the Upper Antelope slot canyon, lighting . It was a magical sight, one I could have stared at for ages. Except that there was another crowd of people just around the corner wanting to come through, and another tour group behind us. So we had to hurry up and take our shots now, then get ready to move. Directing the traffic for me was an excellent guide from Antelope Slot Canyon Tours. I was on a “photographers tour” with about a dozen people, mostly Americans but a couple of Germans and Italians, and our guide would direct us where to look, how to set up our cameras before we had even reached a point (handy for saving time, to assure getting a shot without another tour group walking into the scene). 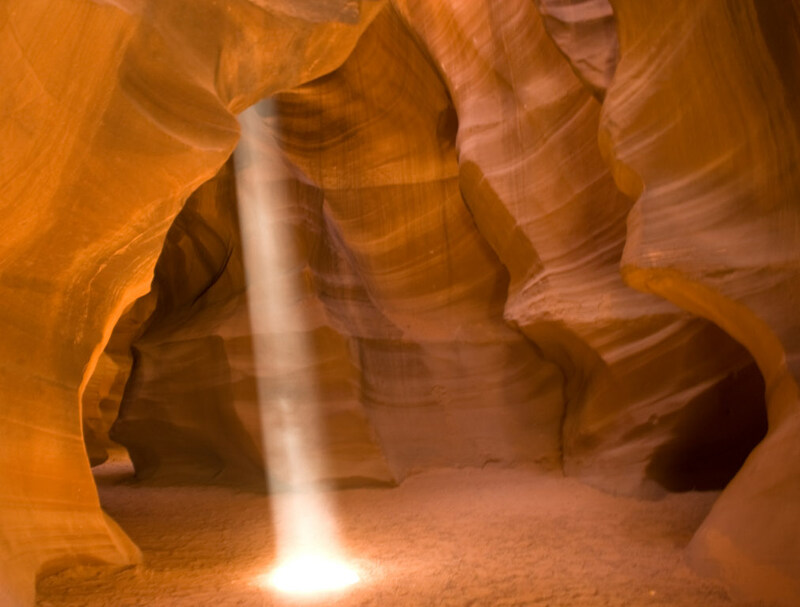 The light beams appear during a small window of opportunity, around midday, when the sun is able to shine down into the narrow opening in the rocky desert. The lightbeams and the red, yellow, orange and crimson textures of the walls draw in the thousands. When you get that number of people wanting to be in the one space at the best time of the day, it is no surprise that careful choreography of sightseers is required. Even then, the occasional jostling and bumps are unavoidable. Patience can be tested with the person who just wants one more shot before moving on, or another with a serious looking camera and tripod who barks to others to get out of the way. Surprisingly, I was one of the few in our group with a tripod, and our excellent guide – a Navajo, as we are on Navajo land, just outside Page, in northeast Arizona – allows me to move ahead and set up my tripod, directing me here to point the camera straight up, there straight ahead. Here, perhaps because not all have tripods, all is not as it seems with the lightbeams. Guides of tours, and there are many of them when we are shuffling through, throw up handfuls of sand into the air so that the dust is reflected in the light, adding to the spectacle. The result is spectacular but in other ways I wish they wouldn’t do this. Each time another handful goes up I am split between taking more shots or protecting my camera. Another time, when a guide from another tour is over-exuberantly throwing fistfuls of dirt into the air in our direction, I am struck by a stone on my face, just below the eye. This being America, perhaps I should have sued him. Emotional trauma, and all that. Despite the crowds, the canyons, created over the centuries by flash flooding eating away at the sandstone, produce plenty of fantastic photo opportunities, although I am disappointed by many of my shots later as my tripod obviously had the shakes, rendering many of the long exposures blurred. 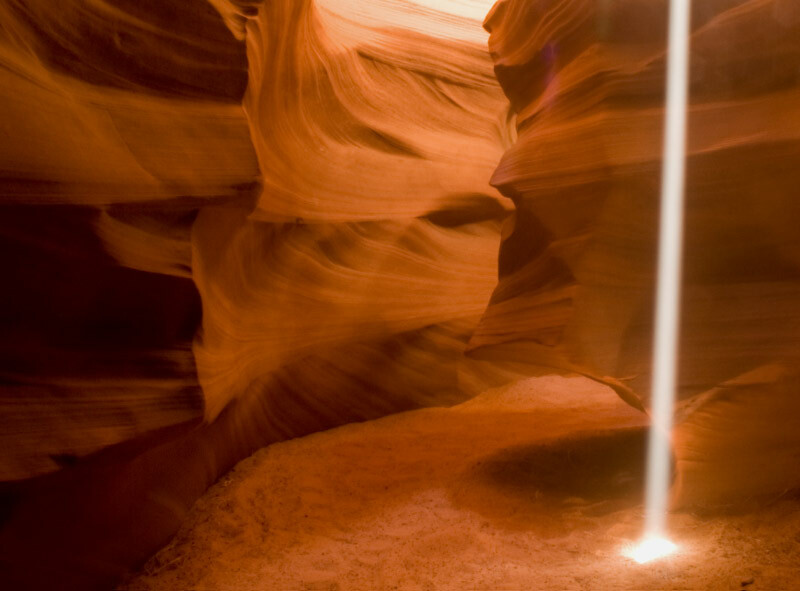 The canyon is also incredibly dusty, thanks to the foot traffic kicking up dirt from the sandy bottom and, of course, the dirt flying through the air to help illuminate those light beams. For the rest of my trip, I had dust specs on my camera’s sensor and had to have it professionally cleaned when I returned home. I wish I had spent more time at Page, perhaps returning at a time other than the midday peak hour, or visiting nearby Lower Antelope, where you are able to wander at your own leisure. You can see more of my photos of Upper Antelope canyon on my Flickr site here. 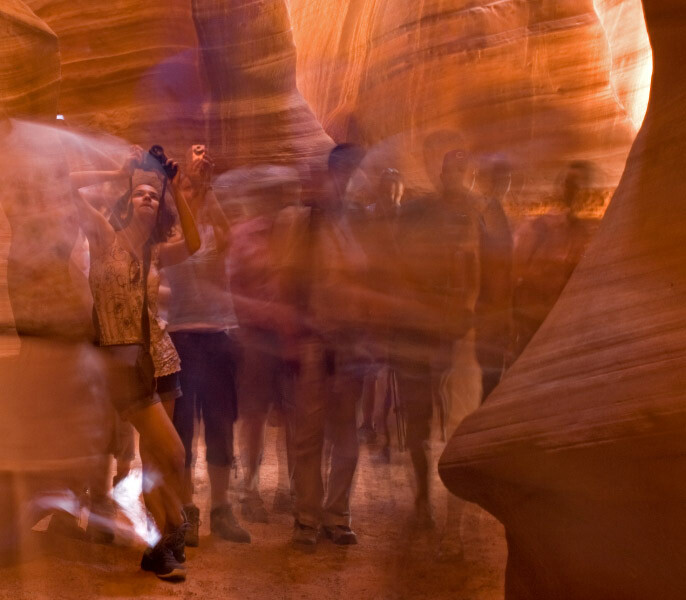 Have you been to the Antelope slot canyons? Which do you prefer, Upper or Lower? I didn’t go to Lower. Make me jealous by telling me (and everyone) how wonderful it is.